Click Say “Hello!” to your favourite new winter cocktail. 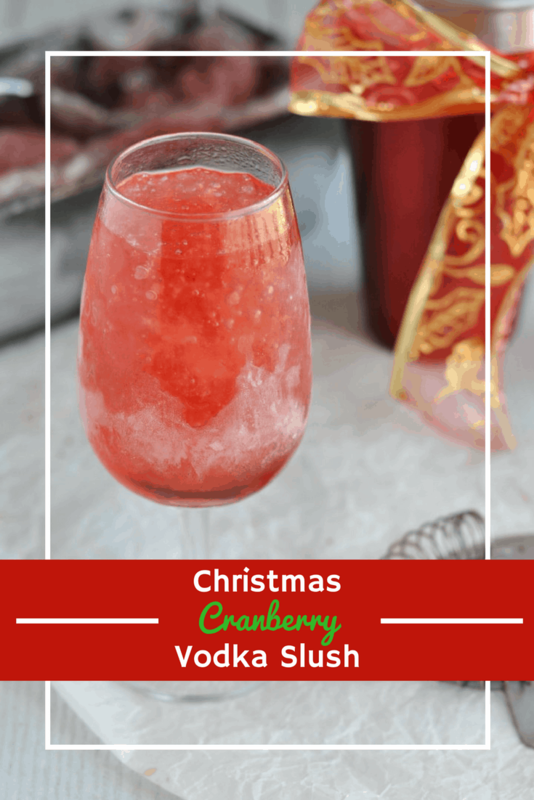 Made with just 3 simple ingredients and taking just 2 minutes to prep, this Christmas cranberry vodka slush is just the type of cocktail you need during the festive season when your house is full of guests, the turkey should have come out of the oven 10 minutes ago and you’ve still got some wrapping to do! 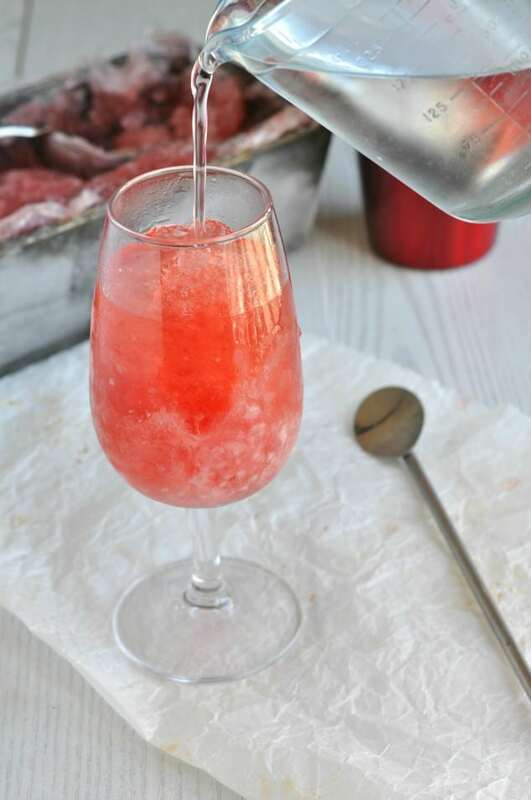 Click here and save Christmas cranberry vodka slush on Pinterest! Whenever I make this Christmas cranberry vodka slush (i.e. every year – it’s that good!) my mind always drifts back to the first time I made it a few years ago. My mother-in-law and sister-in-law were spending two weeks with us for Christmas and five days or so in, things we’re getting a little…tense. So I poured us each a glass of this Christmas cocktail to help us relax, unwind and possibly even be kind to each other. My boyfriend put on a great mix of Christmas music. Some modern stuff, some classic hits, some religious hymns…a little bit of everything. The thing is, “a little bit of everything” also included some more…ahem…adult songs that my boyfriend swore to me he had deleted before playing in front of his 60+ year old mother. To the tune of Jingle Bell Rock. About half way through the lyrics above, my boyfriend, SIL and I all locked eyes, the exact same look of pure panic on our faces as we manicallyclambered over each other trying to grab the mouse first in an effort to stop the song ASAP! We didn’t get there in time, but thankfully my MIL was too into singing the traditional lyrics to the song that we don’t think she heard the version blasting out of the speakers. And that was the last time we ever played songs from that music folder in front of family guests. So each year when I make my first batch of Christmas cranberry vodka slush, I always find myself chuckling as I remember that scene. The two weeks overall were utter hell, but that highlight arguably made it all worth it. You know what they say – it’s the little things that count, right? 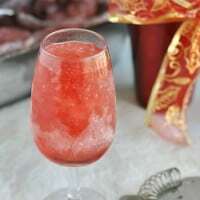 Anyway, where I live, it’s usually around 86F/30C during Christmas, so sipping a slushy vodka cocktail over the festive season is pretty awesome. 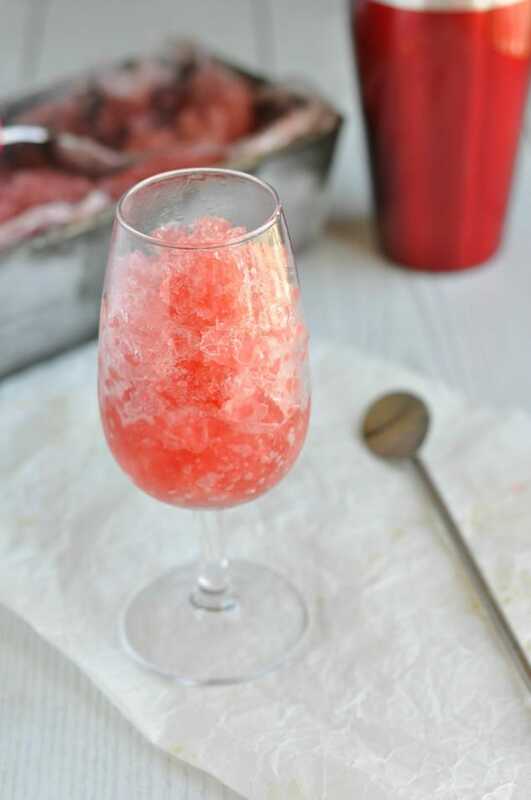 If you get the same thing where you are, I bet your family (or friends, if you’re cool enough to have just friends over for Christmas) would love this strawberry vodka slush or lemon vodka slush. Not very traditional, but seriously yummy! I get that if you’re surrounded by snow all winter you probably don’t want to be drinking something slushy and icy over Christmas. In which case, I bet you’ll go a bundle on my vodka-spiked mulled wine! Or if you’re looking for something a little different, maybe something a bit more tropical, how about mulled sangria? A delicious festive cocktail that takes just 2 minutes and 3 ingredients to prepare, this Christmas cranberry vodka slush is a wonderful alternative to traditional Christmas drinks like mulled wine. Stir all the ingredients together in a medium-size container. Pop a lid on the container or wrap it in plastic wrap and leave in the freezer overnight to set. 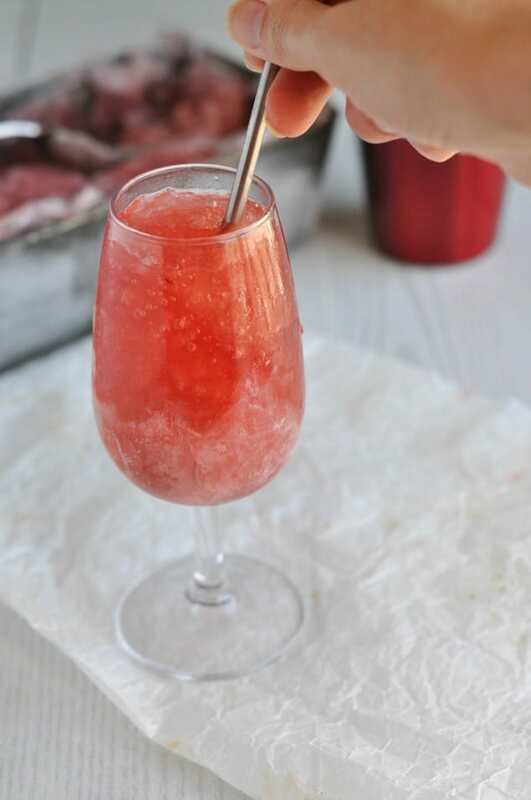 Use an ice cream scoop to scrape out enough cranberry vodka slush to fill your glass 3/4 of the way full. Pour Sprite/7UP over the slush until it fills your glass. Cranberry and Vodka are 2 great combinations. I bet the lemonade makes it that much better. Following via Twitter. New blog hop if you would like to stop by http://onecreativeprocrastinatinggal.blogspot.com/2013/01/inspiration-in-progress-2.html Have a great weekend. Would love to have one of these right now. ;0) They look great. Will definitely be making this drink! Hi! I just found you at Fantastical Sharing of Recipes! This is a great “mommy” drink! I love the look of your blog. I have pinned this great drink. Thanks for sharing! Yes please. It is almost noon here…is it too early to make one NOW! Found you at Hungry Little Girl! I would love to try this – looks wonderful! Thanks, Jilly – it is! This looks delicious. I know we’ve got al the ingredients. I’m printing our your recipe as I type this. Cheers! I saw your link at the DIY Vintage Chic’s Friday’s Five Features.